Perfect for an authentic katsu curry. Chilli rating - medium hot - 1. Suggestion of Ingredients (5 Servings) Sliced onions 200g, Oil 1 tbsp., Golden Curry Mix 1 carton (92g), Water 720ml 1 Stir-fry sliced onions with oil in a large saucepan on medium heat for approx. 5 min. 2 Add water and bring to a boil. Reduce heat, cover and simmer until ingredients are tender, approx. 15 min. 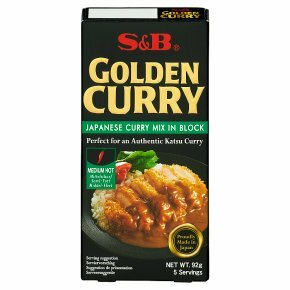 3 Turn the heat off, break S & B Golden Curry Mix into pieces and add them to the saucepan. Stir until sauce mixes are completely melted. Simmer approx. 5 min., stirring constantly. 4 Serve hot over rice and Katsu.